Numerous times, he was told that it was impossible to predict earthquakes, but he has done so accurately, and consistently for years now. 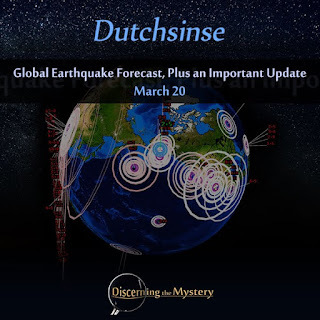 Below is Dutch's earthquake forecast for March 20th. This is an important announcement, as well as a reveling example of what the power that be do to those who threaten them simply by revealing their secrets. On March 30, Dutchsinse had his Facebook page deleted by unknown parties and all of it's contents along with it. Though he was able to retrieve the page, all of his subscribers and associated information were deleted. To add insult to injury, Facebook offered little or no help in attempting to recover any of this information. Here is the video that Dutch posted along with the pertinent links. This is the original page which was recently lost. You can continue to receive daily updates from Dutchsinse here. Personally, I find it difficult to understand why so many official organizations have chosen to target Dutchsinse, as specially since he is only one of many forecasters doing the exact same thing on Youtube Maybe intelligence threatens them. Maybe his example in research is too thorough and reveals too many of their secrets for them to simply let him go without being harassed. Maybe they are upset that their propaganda machine hasn't worked on all of us, and they know that a proper fascist state can't run well unless everyone plays their role as yes-men and yes-women. To be honest, I'm not interested in the why. It's become quite clear that the corporate world is a simply a puppet in the hands of a dictatorial state. ...Facebook included. However, the upside to all of this is that the state and all of the supposed powers therein need our approval and consent in order to exist. If they keep this up, they are likely to loose that approval in record time. Here is a link to Dutch's original post. Please share it and spread the word so he can hopefully gain back what these unknown parties have tried to take from a good person.